Bangladesh, the Poster Child | Watts Up With That? Bangladesh, the largest Delta in the world, has been the poster child of a scary sea level rise story ever since “An Inconvenient Truth”. There is much to be concerned about in Bangladesh, and flooding is most certainly one of the seasonal hardships Bangladesh has to put up with. Sea level rise just happens to be not one of them. 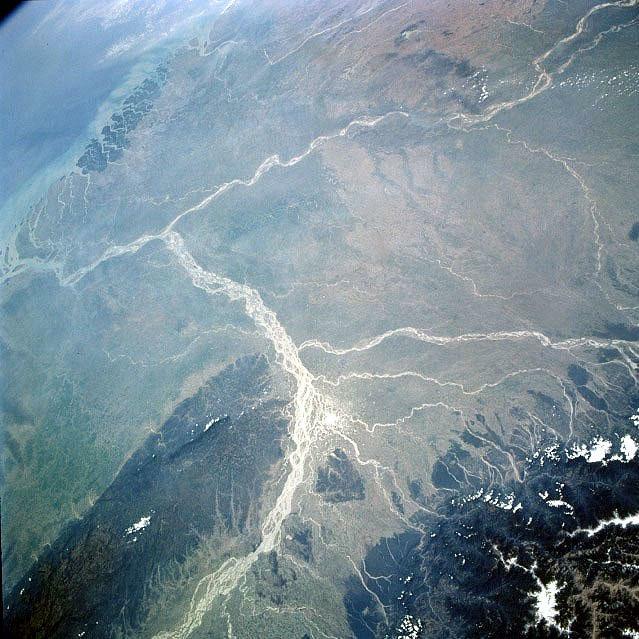 The Ganges and Brahmaputra rivers flow through the Himalaya Foredeep and end-up dumping their sediment load in the Gulf of Bengal, forming a huge delta at the ocean edge. Deltas have one common characteristic in that they are actually formed by the rivers bringing the sediment to the ocean, in this case a huge load coming off the largest and highest mountain range in the world, the Himalayas. 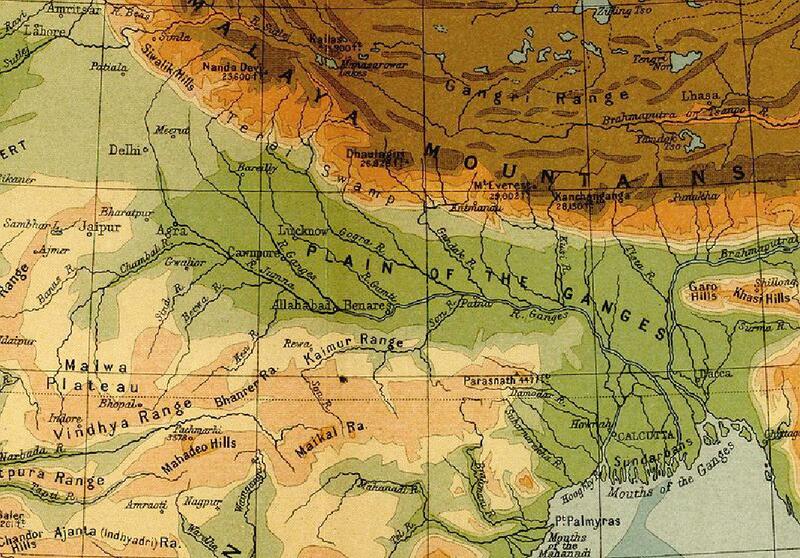 The proto Ganges and Brahmaputra have been active for millions of years, and have been filling the fore deep, a sinking part of the crust caused by tectonic loading of the Himalaya thrust belt. The collision of the Indian Plate with the Asian Plate has resulted in a structural complex deformation of the rock layers, which in itself is a most fascinating and only partially understood process. The net result however is a pile of rocks (The Himalayas) on the north side of the Indian plate, bending this plate down under its weight. The resulting trough is almost simultaneously filled with sediment eroded from this same pile of rocks. The mechanism of deposition is mainly by fluvial processes (river sediments) and alluvial fans directly shedding off the incipient mountain range into the fore deep. The rivers have been finding their way, following the natural law of water flowing to the lowest point. 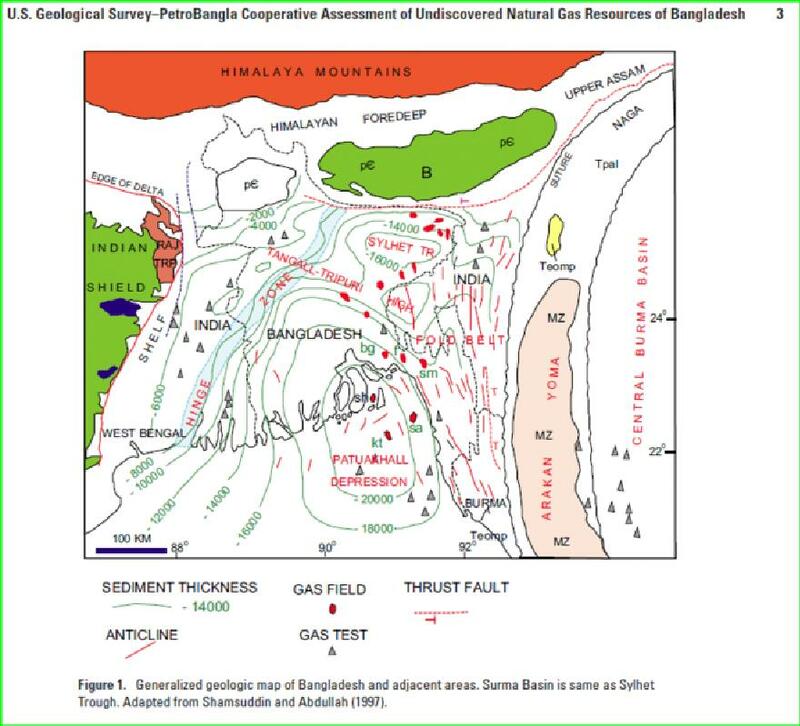 In this case the bay of Bengal, where the subsidence of the earth crust is also influenced by the Arakan-Yoma foldbelt of Myanmar. The resulting depression is filled with sediments transported for more than 20 million years by the proto Ganges and Brahmaputra rivers, and has possibly been an active centre of sediment deposition for more than 60 million years. All this sounds very impressive, but what deltas in essence are is the place where a large amount of fine grained sediments are being deposited due to a significant reduction in flow rate when the river flows into a wider oceanic basin. This deposition is cyclical yet continuous in such sense that it has been a continuous process for millions of years but also very much seasonal and thus cyclical. The Himalayas are subject to monsoon rains as well as seasonal snow melt, resulting in variable yet yearly, predictable jumps in run-off, generally resulting in flooding of the“flood plains” that in the dry season are well above water level. Those flood plains are protected by modest natural levees. Natural levees are formed when a river overflows and loses its coarsest sediment first, in proximity to the main channel, thus building up natural high ridges along the main river body. These natural levees have been recognized as effective dikes by some and have occasionally been enhanced and built up by human inhabitants of flood plains (e.g. the “summer dikes” in The Netherlands). Levees are, however, seldom high and strong enough to withstand large floods, in which case they break through with resulting widespread seasonal flooding. During flooding the fine muds in the now rapidly decelerating river (the same volume of water now flows over a much wider area and even appears to stand still for some time) are deposited and when the flood waters recede, there is a fine layer of mud left behind. This annual or rather frequent flooding allows a delta to build “up” during floods. 1 mm/year still adds up to 1 meter every 1000 years, which is approximately equivalent to the annual subsidence in the Gulf of Bengal, also known as the Patuakhali Depression. Deltas have been extensively studied for many years, partially motivated by pure self-preservation, partially because abundant oil and gas has been found in delta sediments. One of the interesting things about deltas is that they are very dynamic and by their very nature are building up and out rather than drown and disappear. When sea level drops, the rivers tend to by-pass their most recently built sediment wedge and incise deeper valleys in their old river beds, then dump their sediment further out into the ocean and build-up a new addition to the Delta complex. When sea level rises, the delta builds-up rather than out into the ocean and thus stays more or less balanced with sea level. When sea level rises very rapidly, and the sediment load can not keep up, the Delta will find a new equilibrium further back, where the available accommodation space balances the sediment load. The Ganges-Brahmaputra delta happens to have not only survived one of the most rapid sea level rises in geological time, post Pleistocene, but has built and built for millions of years thanks to being endowed with one of the largest sediment loads on earth. More than 16 km (vertically) of sediments derived from the Himalayas has been deposited and consistently built and maintained a delta environment. The sea encroaches where the rivers are not, due to sediment compaction; the fine muds deposited away from the main channels during seasonal floods initially hold a lot of water and over time this water is expelled. Rivers change their course when low areas become the preferred place to flow to. This constant shifting of rivers and river mouths to the lowest areas, forms the distributing process by which a delta spreads and builds. Unless sea level rise and the resulting increase in water depth and accommodation space exceeds the sediment supply, deltas will never drown. 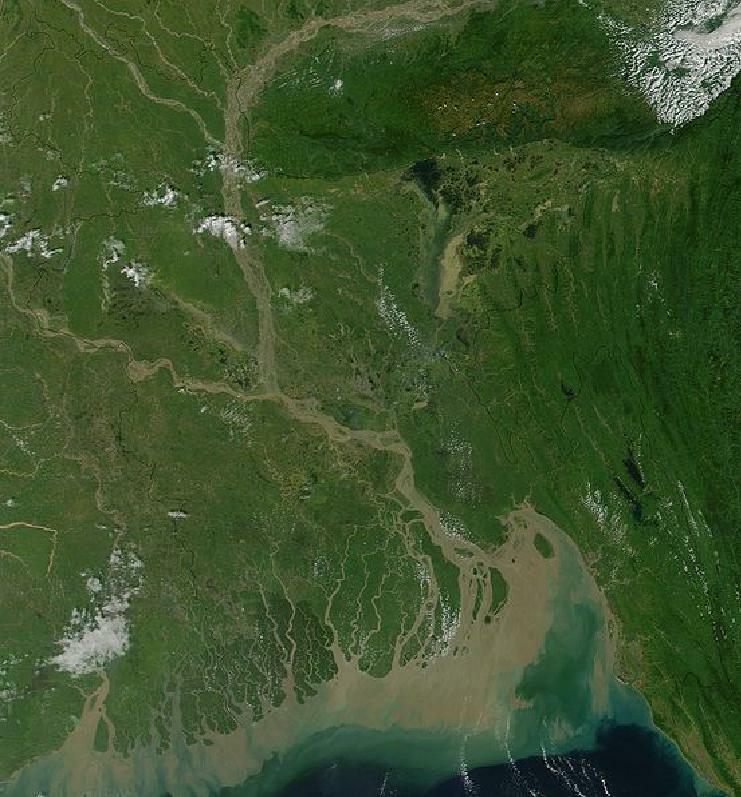 Bangladesh and the Ganges-Brahmaputra delta will be there for as long as the Himalayas deliver the gravels, sands and mud. So what about the flooding? The seasonal flooding is of course a direct result of the dramatic increase of run-off during monsoon and annual snow melt. The rivers are literally constricting the excessive water flow. It can not unload its water fast enough and as a result the water level rises. The levees overflow and/or break through and the floodplains in between the rivers are flooded. Water level sometimes rises by two or more meters. Sea level has nothing to do with it. One mm more or less has no influence on the massive seasonal run-off. The flooding and resulting deposition of a film of mud actually completely compensates for the estimated annual global sea level rise. The lower the flood plain, the higher the flood water column, the more silt and mud is deposited. It all evens out, hence the very uniform flat nature of delta plains. Of course deltas can only build up so much, and are therefore always more or less in equilibrium with flood and sea level. Flooding will be a regular occurrence, for as long as there are monsoon seasons. Unless people build dikes and dams to regulate the flow, floods will happen. While dikes seem to be a good idea, it does modify the dynamics of a system that is in balance with sea level and sediment supply. The Netherlands (effectively the Rhine delta) have been building dikes for more than 1000 years and as a result many old settlements are now well below high river level. The absence of regular sediments added to the floodplain requires ever stronger and higher dikes. Sooner or later the imbalance will no longer be sustainable. Wisely, new settlements are now mostly built with adding thick layers of sand, not only to strengthen the foundation of the new housing, but with an added benefit of artificially elevating the country. Al Gore had it partially right to flag the Netherlands as being threatened to drown, not so much by rising sea level as well by having engineered a safer environment from river flooding, thus starving the flood plains of balancing sedimentation. ← Do solar scientists STILL think that recent warming is too large to explain by solar activity? It seems obvious that deltas will always beat sea level. Otherwise they would not exist. You explain it with the degree of detail which is often missing. Interesting. However, I wonder how long it’ll be before alarmists and politcians attribute the flooding in Queensland, Australia to rising sea levels/rainfall as a result of man-made Co2 induced global warming? Yes, people brainwashed by “rising ocean due to melting polar ice” tend to look over the ocean, forgetting that real danger comes at their back — rising rivers and lakes with more rains, more flash flood, as global cooling sets in. Thus, they are often caught unprepared. Bangladesh has gained net land mass for over 30 years. See here, here and here. Also deforestation upstream deforestation may contribute to increased floods. Results contradict existing paradigms of island response and have significant implications for the consideration of island stability under ongoing sea-level rise in the central Pacific. First, islands are geomorphologically persistent features on atoll reef platforms and can increase in island area despite sea-level change. “When the sea rises, the atoll rises with it, and when the sea falls, they fall as well. Very interesting! Another lie bites the dust, or in this case the mud. What is the mass of the Himalayas? What is their average height? How much energy did it take to lift them that high? How long did that take at current tectonic energy levels? The conventional ideas on mountain building see to me to be comparable to a car crash test film where instead of being slomo the film is time lapse. So when the car hits the wall, it stops. No crumpling because there is no kinetic energy to cause it. The same seems to go for mountain building taking millions of years. They would have eroded faster than they were being lifted, so they should not in fact be there. But they are. Does anyone have ideas for a believable mechanism? But studying geography and geology and river hydraulics sounds like hard work. How much better to indulge in a bit of shroudwaving and blame all those rich people in the west for not paying their Carbon Debts? That’s what brings in the research grants! Update to my last comment. Does anyone know how much deposition of sediments from rivers across the world, and dust and sand blown in by storms, contributes to sea level rise? They are recycling the already debunked scares and introducing new ones. With the CO2 scare and and the peak oil scare in the background billions of dollars are wasted on useless alternative energy concepts and their latest plan now making headlines is their plan to feed 1 billion people with insects. All in the name of the environment. This is becoming a very dark ideology and we better stop it before they make use of their recently acquired powers to control the Internet. Gaia just loves thumbing her nose at her ridiculous warmist groupies. What a girl! I guess the situation in New Orleans is similar, in that fixed concrete levees have prevented flooding for many years and hence the city has “sunk” relative to the local environment of the delta. OT: I just heard a New York based economist on RT saying the climate change will no doubt this year increase the incidence of natural disasters such as earth quakes. And this was shortly after a general whinge about the ignorance found on many blogs. Makes you weep. What a great post, B. Quartero. Delta hydraulics is one of the first things you learn as a muddy arsed kid playing mud-pies in flood areas. Pity most modern kids don’t have those advantages these days. In the current Queensland summer floods parents are being advised not to let their kids play in the water because of possible infection. Given the fact that there is more insect biomass on Earth than humans and their animals put together then eating them would be OK IMO. In fact, insects are already eaten or used to supplement food supplies, so its not that much of a leap. But yes, still the Al Gore types receive far too much media attention. I think what is happening in the EU zone right now might be of concern to the alarmists. Hungry, cold and over taxed people are angry people. Very interesting post, and very well written! 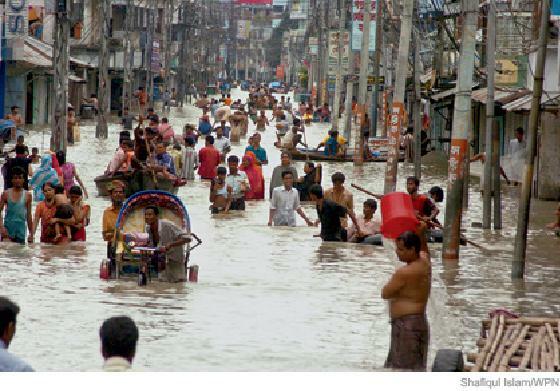 Any flooding this year, be it in Bangladesh, Pakistan, Oz or anywhere else will of course be attributed to AGW. As this paper points out in a net side, deforestation upstream is one of the culprits. Like the now so common use of flood plains for settlements, it is interference with the environment which leads to the increasing losses of life and the increasing economic damage – not the rise in CO2 -> AGW. Au contraire. Armed with a good topographical map and/or geological map of your local area and the purchase of “A View of the River” by Luna B. Leopold (available at Amazon Books) you can easily learn about river hydraulics and how rainfall, weather, and stream flow interact. Not only that, you might actually enjoy what you are learning. Throw in a homemade weather station and you might even qualify for a WeatherUnderground citation. Worth a look anyway. It’s all natural variability according to the findings of a team of CSIRO researchers led by Dr Wenju Cai. I think that your right the Bangladesh thing might be s little overblown. But I also get the idea that this a bit of a straw man. B. does explain that the delta does respond to sea level rise. We expect that any appreciable sea level rise is not seen now or in the near future but will be seen on a 100 year time scale. Is the rate of sediment build up fast enough to compensate. It looks as if the delta will gain 100mm in sediment while losing 500-1000mm in depth. Looks kind of negative to me with the shore line moving inland. Also if the weird weather we are having lately becomes permanent (a 20 year old prediction proving correct perhaps) it could get serious for Bangladesh. We know it suffers badly from storm surges. yea, fowls and fishes through much cold and hunger perished. More snow worse than anyone could remember, amazing. I would posit that your prediction from 20 years ago isn’t worth the paper it was written on. By the way I would recommend reading the Anglo Saxon Chronicle which is a fascinating look into history. Well written, informative post. Thanks. Do any politicians visit WUWT? It is so frustrating that the many superb articles published here seem to be ignored by our political masters. Interesting. However, I wonder how long it’ll be before alarmists and politicians attribute the flooding in Queensland, Australia to rising sea levels/rainfall as a result of man-made Co2 induced global warming? The BBC are already trying just that, any weather event is simply a propaganda tool for the BBC to use. Fortunately the Australian commentator actually told the truth to the BBC anchor, it is a natural cyclic post drought event and nothing more. You can imagine that this particular guest will not be receiving another BBC invite any time before the next millennium. The BBC researchers will be looking for anyone regardless of qualifications who will be more ‘on message’ next time. This is an opinion column. Not a single peer reviewed article citation. Statement that “They (deltas) will always be in balance with sea level but almost by definition increase in size, if rivers are allowed to follow their course.” is just plain wrong. Misuse of the work balance which implies no increase or decrease, which means the deltas could therefore not exist. A growing delta is not in balance, it is growing. I gotta say “People living in deltas should learn to swim” is a flippant comment that seems pretty insensitive to the thousands of people who have died in Bangladesh flooding. That’s like telling the okies in the 30s they need to learn how to farm with less water. I agree that blaming AGW for Bangladesh’s woes is foolish, but the Bangladeshis should be educated and allowed to make their own choices, not mocked. In a way, many Bangladeshis have made the same decision that New Orleanians have. I wonder which group of people is counting on the largess of others in times of trouble more. Found them from a google ad. Yeah, did all that and confirm that it is both interesting and enjoyable. For at least forty years, hydrologists, including those with the oft blamed Army Core of Engineers, have been warning of the danger that New Orleans faced, but the blasted liberals were too busy, giving away tax dollars in order to get votes, to hear the message or do anything to mitigate damage. When the obvious disaster strikes, in exactly the same manor as predicted by the most likely scenario ( cat 4 or 5 hurricane), the morons run around screaming their brain-dead heads off about it being Bushes fault! Most people have trouble with a concept called ‘dynamic equilibrium’. Think of a balloon with a small hole in it, leaking air out. You can keep it the same size by blowing in just enough air to balance the air leaking out. Similarly, ‘balance’ in a delta might mean steady growth (not accelerating or decelerating). Yes, it’s a little loose technically, but it is a useful way to describe steady growth – in balance. What words would you rather use? Mountain ranges like the Hymalayas are formed due to the collision of two tectonic plates. They are in effect wedged into each other. The resulting rather complex make-up can best be described as a series of stacked rock layers, thickening the crust with some slices being pushed up and over , other slices being pushed under. Due to the fact that the Upper Crust rocks are lighter than the Lower Crust and Mantle, the isostatic equilibrium is disturbed and the massive pile of rocks will try to regain equilibrium and thus rise. This is how the mountain ranges and especially the high topographyies are formed; without the rise, the deformation would remain invisible in the sub-surface. Once the range start to rise, the erosion picks-up and create the steep valleys, leaving the most resistant parts as mountain peaks. Only when isostatic equilibrium has been reached will erosion slowly lower the mountains and over many millions, probably billions of years make them disappear. Mountain ranges formed more than 300 million years ago are still recognizable as topographic highs. You must be a lefty as your criticism is idiotic. All you guys do, when confronted with facts, is to distract and confuse, by screaming for reference for the obvious, and twisting about the meaning of what is written so that you can denigrate it. But what you really are doing is denigrating your own misinterpretation. Not being able to understand what the author wrote, makes you look mighty foolish. BTW, the behavior of deltas as explained here is an accurate assessment of what has been understood by REAL scientist for decades. And just so you know, estuary ecology (including the physical character of deltas) was one of my two main areas of study, before I got disgusted by all of the Marxist nonsense that was being crammed down my throat. Pal Reviewed papers does not make science. Duplicatable experiments makes science. I notice that somewhat to the south west of Bangladesh the Assam tea crop is being decimated by global warming. I wrote: in balance with sea level. This means that deltas don’t sink , unless they are starved of sediment, in which case the delta will not be there for very long or would never have been there in the first place. They also don’t get much higer than sea level. It is a vertical or topographic balance. They do built out, again “up to sea level” , not much higher. Some parts of deltas are periodically starved of sediment and thus sink, or are flooded for prolonged periods. Those areas become prefered deposition centres once rivers break out of there natural levees during spring floods, then prefer to flow to the lowest points, eventually dumping their sediment in those lows. Over time this amounts to some form of balance. But yes, deltas build out and are not in balance geographically. The avulsion process, when rivers change course, is also highly erosional and modifying topography. If you prefer to approach nature that way indeed very few things are in balance. If you want to read more about Deltas I am sure you can find your way to a fine collection of decent text books. I gotta say “People living in deltas should learn to swim” is a flippant comment that seems pretty insensitive to the thousands of people who have died in Bangladesh flooding. —-the Bangladeshis should be educated and allowed to make their own choices, not mocked. In a way. Joshua. Gee – aren’t you the politically correct babe! What’s wrong with making observations like this? – and what’s with this crap about educating the Bangladeshis? My guess is that they are well aware of THEIR climatic conditions and are in no need of being educated – and I bet most of them know about swimming too. Sheesh! Thanks for the links and comentary however, I knew what “position” the MSM, both in Aus and the UK, would take. Snow, well almost everywhere, and 100 year floods in Aus. Its proof of AGW, although 100 – 150 years ago, similar floods in the region. Live in a flood plain, expect a flood! Must be due to SUVs in the US and patio heaters in the UK right? Strange though we are not having a usual “summer” here in Aus, well not on the east coast, Sydney anyway, just like the last 3 summers, COLD and wet. Sounds familiar, although inverted. Check out what Cairo was 2000 years ago. Hint: it was a sea port. Where is it now? To my mind, a balanced delta would be one that oscillated around an average land area. i.e. sometimes the sea would eat away some of the delta, sometimes the rivers would deposit more new land. However, the whole point of a delta is that it’s growing, creating horizontal land out of vertical land (mountains). I still support Quaternero’s point that as sea levels rise, deltas will switch from generation of horizontal land to generation of vertical land. When an equilibrium is reached however, it’s back to the generation of square footage. They need to understand what “living on a delta” means. Its like living at the foot of Vesuvious, or Mt St Helens. Those who understand know one day, maybe not in your/our lifetime, but one day sure enough nature will act, and we can’t stop it. Most, who live in detal regions, don’t understand and that is why so many die when “water” takes its course. This is a “water world”, and nothing to do with the BS film “Waterworld”. What does this portend for New Orleans? From what I understand, the land under the city is sinking, and since the city, being below sea level, is protected with levies the river is not allowed to deposit silt. Consequently, the situation in New Orleans will get worse and worse. People living in deltas do understand the potential dangers, just as do those living in Los Angeles, for example. It is simply a matter of what the individual sees as practicalities. Of course. Or Naples, 16m people at the foot of Vesuvious. Istanbul, another 16m people living on a ver active fault. Sure “it” will be “worse” as more and more prople live in these zones. 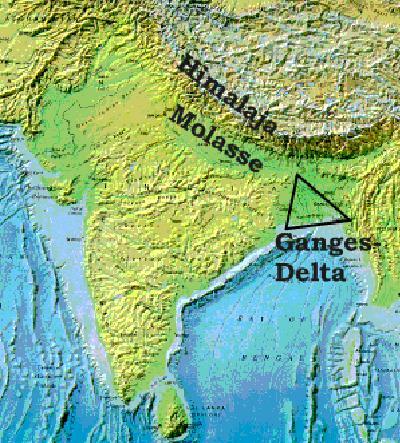 Stated more simply, Bangaladesh IS a delta. Its geography is thus nothing much like a bedrock-based locale, and the lifestyles of the residents is entirely centered around exploiting the many features of deltas. They are very productive, but rather dicey places to build permanent structures! Assam is north east of Bangladesh. And in the linked article we learn that rainfall has decreased by 20%, and that last years crop was damaged by to much rain, both presumably due to CAGW. River sedimentyation contributes between .02-.03mm/yr of sea level rise. The only risk to the Delta is engineered flood schemes like large canalised channels which would instead move the sediment out to sea, disturbing the natural processes of sediment accumulation. Then there is the issue of planning, if an area is going undersea or is prone to flooding – dont let people build there, or if they do, make sure the building floor levels are above the flooding and they have a stash of backup food etc… or tell them “live there at your own risk, we wont help you”. I am often shocked at the poor planning of even councils in the western world that let people build in ephemeral lakes, functional flood plain, below perched canals / levies / leats or even over a river valley blocking the rivers flow path and reducing its capacity! Man is normally to blame when there is tidal or fluvial inundation, but its not due to co2 emissions, its normally as simple as a poor decision to build there, or the 10,000 ha of forest upstream has been stripped leaving bare-fields instead (trees are very good at reducing run-off from land as they massively increase evapotranspiration and store a lot of rainfall on their leaves and in the leaf litter and buffer out peaks in rainfall). Are you by nature overly sensitive or just about people living in deltas? Good advice is good advice period. I guess I’m pretty sensitive in general, though I’ve rarely been called politically correct in RL. I just think that if Anthony jumps on the alarmists for their exploding people ad, that that kind of sets the tone. I think that telling people who are suffering from a natural disaster to learn how to swim is inappropriate, yea though it be a repetitive disaster in nature. I mostly agree with those words, though of course some inundations are entirely ‘natural’ – 100 year precipitation events and all that! The biggest issue with flooding is the constant man made alterations of rivers along their length, mostly undertaken to gain or protect building land of course. But all any river defenses/alterations do is upset the natural balance and push the problem (i.e. the occasional excess water) somewhere else along the river! 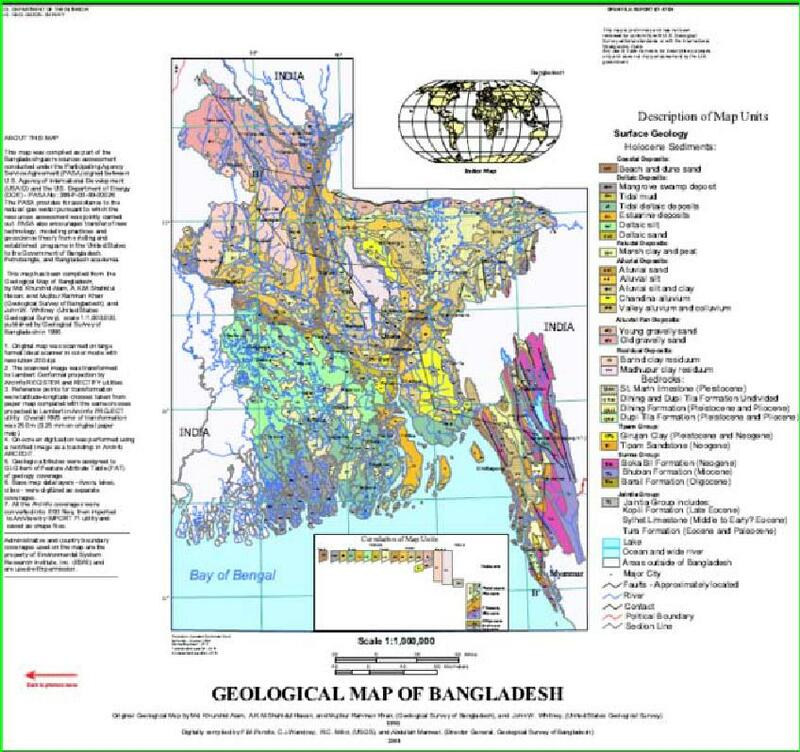 Bangladesh (was East Pakistan) had for years manipulated their geography (with soviet assistance) using widespread flood control, re-routing natural drainage, building large scale irrigation schemes, land recovery projects, and damming rivers for hydroelectric schemes, etc, etc. http://www.mowr.gov.bd/about_bwdb.htm and re-edited in the last year to remove most references to the soviet assistance. Bangladesh also has an unsustainable population growth when the high population density is considered. Just to add to this: A letter appeared in the “Australian” a few days ago that climatologists having been saying for decades that AGW would cause “extreme events” There you go it didn’t take long did it.! Yes folks cold snaps, massive flooding, bushfires, low clientel numbers in Bolivian brothels – all due to climate disruption. Great to see a well explained article. I have previously lamented the loss of physical geography from the education system. It astounds me that simple principles like “fast rivers erode, slow rivers deposit” have been so easily forgotten. Just a few questions and observations. What role does vegetation (mangroves etc) play in moderating levels of sediments and temporary island construction? Most photos of the Sunderbans show mangroves. Does it enhance deposition and reduce erosion during flood events? Consolidation of sediments is understood in engineering foundation design including the use of preloading to accellerate consolidation. Does the height of deposition similarly have a limit? The other half of the equation is the reality that people have always settled near to water for a number of reasons including security of water supply, trade and transportation and not coincidently, deep alluvial soils are great for agriculture. So it is no coincidence that flood plains make attractive areas of settlements. It is just unfortunate (for the inhabitants) that they happen to FLOOD ocassionally – or in the case of Bangladesh, seasonally with the monsoons. The current floods in Australia are not unusual on a historical scale and largely a result of the current La Nina phase. Some of the flooding is actually LESS severe that it would otherwise be due to the existance of man made dams that moderate peak flood levels. River gauges on the Burnett River that flooded Bundaberg actually show flood peaks of 10000 cumecs upstream of the (enviromentally unpopular) Paradise Dam but no less than 4000 cumecs below the dam showing the benefits of temporary flood storage. This significantly reduced the scale of the floods and no doubt the quantum of “climate change ;-)” refugees. It is also unsurprising that areas of western Queensland currently flooding are actually described as “large areas of fine-textured alluvial plains associated with the main tributaries of the Condamine River system”. In other words, nothing unprecedented here, just nature doing what it does. There’s an unusually blatant piece of spin underpinning that claim. I thought I’d check the statistics for historical yields, and in fact, we’re talking about a single year small drop in yield which is well within the bounds of ordinary year-on-year fluctuations. The only way you can get a drop is to measure over a period of a couple of years, since any longer period shows an increase. I wrote: “people living in deltas (in general) should learn how to swim”. This is ment to be entirely pre-emptive. It also includes people in the Mississippi delta, the Nile Delta, the Rhine delta etc. . It is the simplest way of avoiding completely unnecessary drowning due to entirely predictable and seasonal events and to recognize the dangers of your environment. I would be surprised if more than 25% of the people in Bangladesh can actually swim. I suspect that none of the female half and less than half of the male population can actually swim. It also would also surprise me if swimming lessons are part of the school curriculum in New Orleans, while I know it is part of the school curriculum in the Netherlands, for a good reason. If someone wants to regard this comment as flippant, that is their prerogative. I was actually quite serious about this, including having boats. Inhabitants of the Mekong delta prefer to live on boats. The danger lurks when dealing with such an immense delta as Bangladesh, where flooding occurs hundreds of miles away from the coast line, in a flood plain that can be reasonably well protected by natural levees for dozens of years and then suddenly floods when a levee breaks. The most effective option is to build settlements on man-made elevated “highs” rather than to dam or control the run-off. Fixing the enormous rivers and their sediment load according to human design is a monumental task, likely to fail in the long run. The population growth rate in Bangladesh however guarantees that only the elite will be able to secure the highs, leaving a large percentage to fend for themselves on the least favorable lows. I really don’t know what else to advise. The points about the Vesuvius are indeed quite analogous. Fertile soils will always attract people, never mind the dangers. Naples will eventually become the next Pompeii, but my advice to them would be similar: have a boat to get out of there, highways will be plugged when it matters. Swimming however detracts from the main argument. Although Stumpy believes thata this is “high school geology”, I believe that insufficient geology is actually taught at high schools, or else Al Gore would have realized his complete ignorance. Anna v said itwell: try to convince them..
Atolls flooded by sea level rise, what a joke. Atolls are formed when islands sink into the ocean, either by sea level rise, or more likely because the weight of the island presses down on the ocean floor and causes the crust to deform. As the water rises, the coral grows around the perimeter of the island. Eventually the island sinks from view, leaving a ring of coral. Global warming is not a threat to coral. Quite the opposite. In general cold water corals are rare. Typically coral needs warm water. Coral bleaching results from temperature changes in the water. As the water heats up, different species of polyps are advantaged, and take over the reef. Bleaching is what we observe during the change in ownership. The bleaching does not persist. Come back in a year and the coral will be healthy once again, as the new owners are hard at work growing the reef. Cold, fresh water and sediment will kill reefs, as will over fishing. The reef needs coral eating fish to remain healthy, otherwise algae will soon smother the polyps and kill the reef. Perhaps I’m not allowed a tiny bow here. I have been entreating someone here to debunk the Bangladesh flooding due to CO2 for over a year – making a small contribution to how the system works on the Ganges, Mississippi, etc. but, as a Precambrian geologist (Billion+ yrs old rx) and mining consultant, hoped a good sedimentologist would come forward for this important job. Thank you B. Quartero – an excellent job, and lets hope climatologist practioners who did not know the dynamics of river deltas will benefit and relax the alarm level in this sector. By the way do you notice in the flooded street above – there is no panic, people holding hands, carying their babies and goods calmly down the flooded street – no alarm here.